I love this image. It might just depict the funniest thing I’ve ever seen. 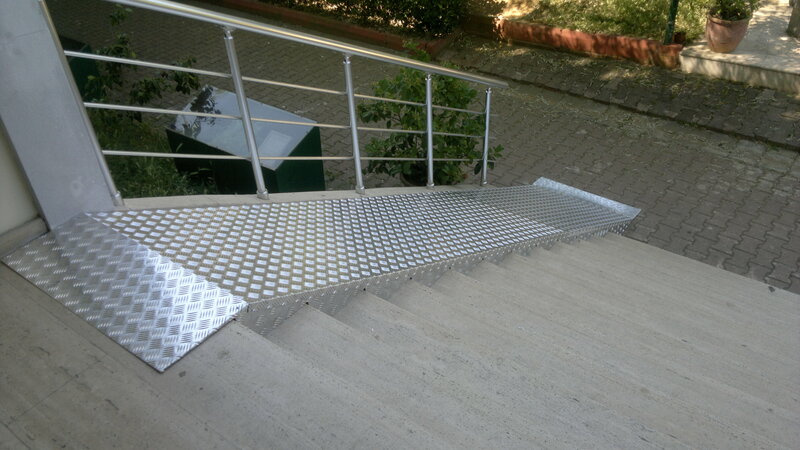 If you can believe it, it is the wheelchair/pram access that was installed in a school I worked at. There is nothing fake about this image. Please, count the steps. Think about the geometry and physics involved here. I don’t think the people who designed and installed it did. Hello and welcome to the hub of my online presence. That’s me on my beloved Dymchurch beach. I am a crime writing author publisher. Since early 2017 I am also represented by Bloodhound Books who have taken on my Booker & Cash series. You can find out more about the books I’ve written including links to both Amazon UK and Amazon US by clicking on the options in block capitals in the header menu above. The Prole Soldier – a story set in a dystopian near future. As you can see from the comments pages in the header menu, I enjoy hearing from readers, so if you’d like to get in touch, don’t be shy. Thanks for your feedback. Great to know R&M#2 hit the mark. Remembering Lillian West’s carpet gave me a chuckle. Please let me know what you think of B&C when you’re done. Thanks for your ongoing interest in my writing. Hi Oliver,Just finished your newest Acer book and left a review on Amazon. Hope you like it. I loved the book and am eagerly awaiting the next one. Great to know you enjoyed the latest Acer. Thanks for your continued support and positive feedback. Much appreciated. Hi Oliver just finished Booker Cash no one I,like Booker not a flash hero just a ordinary guy . That’s great to know. Thanks very much. I hope #2 builds on the B&C experience for you. I just finished #3 this week. I have now read all of the Acer Samson, Booker and Cask and Romney and Marsh in that order and I have thoroughly enjoyed all of them. I liked the way that you got Peter Grimes into Bookers. Now looking forward to any additions to these collections because there are always things to resolve. However, did I miss something in that after Grimes’ demise what was the resolution of the lawnmower thefts and the insurance guy who rammed Peter’s car? Many thanks for your time and trouble to get in touch with such a positive comment. And sincere thanks for your support in reading all of my series. All much appreciated. Good to know that you’ve enjoyed the reads. I’ve been asked about the resolution to the lawn mower issue before. The way I saw it was that that particular incident was outside the jurisdiction of Dover police and so it would have been the responsiblity of Folkestone to investigate and deal with the aftermath of events. Dover CID were happy to hand over anything they could about the crimes on their patch given the tragedy involved. I hope that answers your question. Just finished 4th Acer book. Thoroughly enjoyed all 4. Hope there will be more. Many thanks for your very positive comment on the Acer books. Much appreciated. Good to know you enjoyed them. There is an Acer short story in my book Three Short Blasts, which ties up a couple of loose ends. Good to hear from you again. Great to know that you’re sticking with R&M and enjoying the reads. Thanks for your kind words. I was living on Romney Marsh at the time of the disaaster. I knew people who lost people. A tragic event. Many thanks for your comment and for giving this one a try after reading other books of mine. All sincerely appreciated. B&C#3 is next out. Just needs a little more work and it’s off to the proofreader. Just finished “Dirty Business” and really enjoyed it. It made a change to read about the exploits of a central character in this genre whose exploits were not too “super-hero with special powers”. He has his share of luck – both good and bad – but does not rely on anything which stretches credibility too far. The plot developed quickly and maintained pace sufficiently to make me reluctant to put it down. Thought it ended very abruptly and I’m assuming the next book in the series picks up where this finished – can’t wait to see what happens next. Many thanks for your time and trouble to leave such positive feedback for Acer#1. Much appreciated. It’s always good to hear from readers enjoying the reads. I look forward to seeing how #2 grabs you. I am an avid reader of mystery/thriller and have bought used books by the pound from two sources the cost for postage to Canada was horrible. Since then my kindle is years old now. And through Amazon.ca I discovered you. When I read most books I am aware of the actual woods and sentences With your easy flow, crisp phrasing.and story line..I am totally unaware of the actual printed word. It is as if my subconscious is reading and I am actually in your story. I thank you for your work and look foreward to reading your entire output. Many thanks for your time and trouble to feedback so positively and encouragingly on my writing. That and your downloads of my books are sincerely appreciated. I’m glad you’re enjoying them. I’m happy to say that I get my fair share of comments from readers and I’m always grateful. Sometimes someone says something that really make me… proud, I suppose is the best word. What you say about being in the story is one of those remarks. Thank you. And by coincidence in this week’s blog post that I shall put out in a day or two I say: ‘Something I’ve realised about my writing: I need to ‘see’ it in order to write it.’ So it works both ways. Always good to hear from you, especially to learn that you’re enjoying the reads. It’s very gratifying. Thank you. Probably the aspect of the R&M FIles I enjoyed the most was my idea of what’s funny. Not everyone shares it and not everyone warms to Romney, but i like him and it’s good to know I’m not alone. I absolutely LOVE your Romney & Marsh ebooks!! After reading 1, I downloaded the rest of them quick fast & immediately I read MEGA MUCH, mostly crime/police books & so far . . . you are my favorite. I come from a USA police family, but I REALLY LOVE how it is done “across the pond”!! Thank you for sharing your stories. Sincere thanks for getting in touch with such a wonderfully positive message for the R&M Files. Your kind words are much appreciated as are your downloads of the books. It’s always good to hear from readers who enjoy them as much as I enjoyed writing them. Thank you. Any chance of having your books available for the Canadian KOBO reader? I am enjoyinhpg your books but might have to buy a Kindle reader. Thanks for your question. It’s good to learn that you’re enjoying the reads. At present, I’m afraid that only two of my books are available anywhere but Amazon, owing to me being locked in to exclusivity agreements. I really appreciate your ongoing support of my writing. Thanks very much. It’s good to know you’re sticking with them and enjoying them. Next out is B&C#3 in a couple of weeks. Thanks for your comment. Good to know that you enjoyed the read. I have an uncomfortable confession to make: I’m afraid I cannot remember the reason Smith involved Eda. That might seem appalling seeing as I wrote the book, but my memory is shocking and it feels like a long time ago that I last read this title. I have a vague recollection of something but i cannot for the life of me tease it out of the shadows. I do go back to my books from time to time and next time I look at DB I’ll bear your query in mind in the hope I can post a better reply here. As always that’s great to know, thank you. Much appreciated. I think that Tom is a character who is either going to grow on you or push you further away. My favourite historical novels are the Aubrey/Maturin books by Patrick O’Brian. Quite possibly you are familiar with them. They are, in my humble opinion, so much more than naval history. A real wordsmith. Hi Oliver, I’ve just finished all of your Romney&Marsh files. I’d just like to let you know that I’ve enjoyed them all very much. They really are books that are very hard to put down! You’ve bought to life some wonderful characters and gripping story lines, thank you, now I’m looking forward to your reating your other two series, I’m sure I won’t be disappointed. Many sincere thanks for your time and trouble to leave a comment here on your R7M Files experience. Much appreciated as are your kind words and downloads. I had a lot of fun writing these books and it’s always good to hear from readers who share that. Thanks in advance for trying one of my other series. The first Acer novel is currently free on Amazon. If and when you get around to anything else of mine, please let me know how it went. Hi Oliver, I just read: Rope enough and thoroughly enjoyed it. I have to admit I tend to download free books and as a consequence skip a number of books before I settle with one. I will be actively looking to get your collection, and even pay for them you’ll be pleased to know. Your style and use of English suits me perfectly and I have found myself seeking breaks in the day to keep reading. Thanks for the work, really enjoying it. Regards Ian. Many thanks for getting in touch with such a positive message. Much appreciated. Good to know you enjoyed the first R&M File. I hope book two gives you as much reading pleasure. I have just read Enough Rope in one sitting – it was unputdownable! I can’t wait to read another R and M ebook. Thank you. Many thanks for your very encouraging message. Great to know that R&M#1 gave you reading pleasure. I hope book #2 does the same. Hey Oliver, There doesn’t seem to be a comments page for Cold Kills, or have I missed something? So I guess I have to write it here. I finished the book a little while ago, and been thinking what to comment! I’ll start again, have you ever watched ‘Tales of the Unexpected’ written by Roald Dahl? I felt it was a bit like an episode from that series. It was a story with a cleaver twist. I kept wanting to read on at the beginning, only because I wanted to find out where it was going. I nearly gave up half way through, but I kept going and eventually wanted to finish it. I didn’t like any of the characters, was I supposed to? I didn’t even hate any of them, just meh, so maybe that’s why it was a little hard to get in to it. I understand you wanted to try something different and you succeeded. It was well written and a different idea. Popular enough I’d say! Personally I like having at least one likable person, all your other books have main characters whom are likable and interesting, I feel want to join in with them on their adventure or solving mysteries or crimes. I guess that’s just the way I like books. Sorry if my comments seem a bit negative. Thanks for your comment. I’m just glad you gave CK a read. Your support is much appreciated. 🙂 It’s absolutely fine that you weren’t particularly enamoured with it or any of the characters. I’ll take all kinds of feedback and learn from it. You are right – there is no one much to like in the book and maybe that was a mistake of mine – we all like at least one likeable character ito relate to. Many thanks for your comment, Ian. Much appreciated, as is your ongoing support of my writing. Glad you enjoyed this one. Thanks for your comment, and thank you sincerely for your ongoing support of my writing. All much appreciated. The third B&C is ready but after interest from a publisher publication has been delayed, probably until the summer. I might have to write something else to fill the time. I will make announcements on the blog whenever I have news. I hope you enjoy Cold Kills. Good to know you’re enjoying the first R&M File. I’m sorry but the others are only currently available through Amazon. I will be doing something about that in the future. I do have one other book that is available to read on Kobo as a free download. It is the first in my Acer Sansom series, but then, again, the others are only available on Kindle. I finished the Romney and March series and loved all of them. I’ll miss my friends in Dover. Thanks for giving me many hours of entrainment. Looking forward to meeting Booker and Cash. You have great talent in my opinion. Your books need to be discovered by more people. I found you because Rope Enough was free on Bookbub. After reading it, I bought the series, which I don’t do often. Please keep writing. Hi Lillian, Many thanks for your time and trouble to leave such a positive comment. Much appreciated, as are your kind words for the R&M Files and my writing. You’ve made my day. Good to know that the Bookbub promo did its job. If and when you get around to B&C, please let me know what you think. Hi Oliver – I was sent ‘Poor Hands’ as a pre-read from Bloodhound Books and after reading 3% (on the kindle) I felt I needed to go back to the beginning. I wasn’t disappointed – such a different series and so well written – I love the main characters. I particularly like the descriptions of the area, being from the Southend area originally I can relate to the vast areas of sand when the tide is out and remember going out over this to ‘find the sea.’ I miss this as I now live in the midlands but you have bought back the good memories. I have now gone back to ‘Poor Hands’ and know that I will finish it before publication date so I can leave a review on Amazon and Good Reads – I have Romney and Marsh 1 ready to read next. Glad I found your writing and thank you. Many and sincere thanks for taking the time and trouble to get in touch. I always appreciate hearing from readers. I’m really glad to know that you’ve enjoyed B&C. Of all the books I’ve written that series is closest to me – I was born and bred on Romney Marsh and I’m back there now and loving it. I intend giving that pairing a few more adventures yet. I hope Romney and Marsh live up to expectations. I had a lot of fun with those two too. Please let me know how that series grabs you. Since firing up my Kindle for the first time in January 2016 (yup, a Christmas present from my lovely wife), I have become an inveterate reader. (172 books to date) I have discovered so many authors that I enjoy and would never have found, if it were not for Kindle. Of all those wonderful books, I have to say that your three series (I have read all of the books) are the ones I have looked forward to reading the most. Each one of your books is a treasure trove of finely woven plots, likeable characters and a wonderfully light sense of humour. With some writers, I am keen to reach the final page to find out ‘whodunnit’. With yours however, I find myself savouring every word. They really are beautifully written. I started with the R&M books. Once I had finished those, I went onto the AS series. Now I am hooked on B&C! I have literally just finished ‘Poor Hands’ and I have to say that you had me laughing out aloud in places. I can’t wait for the next instalment. First, many thanks for your time and trouble to leave such a positive and encouraging comment. Much appreciated as are your very generous words for my writing. One of my great pleasures as a writer is hearing from readers who are enjoying the books. I am always particularly thrilled when a reader who has read and enjoyed one of my series goes on to try another and then maybe another. I take that as a huge compliment. So thank you for that also. I’m working on another stand-alone story at the moment and then I’ll be back to Booker & Cash. Best wishes and once again many thanks for getting in touch. I love your writing and intend to read everything you’ve written. The pleasure I take from reading your books is enhanced by the lack of spelling mistakes (only one so far) and grammatical errors which dog so many others. So far I have read two of the Acer Samson novels and three of your Ten Tall Tales. Is there a pun I’ve missed in the Acer Sansom name? I ask because of “Romney and Marsh”; “Booker and Cash” and “Nile UK” (I’d’ve gone with “orinoco.com” myself). I was amused by your use of the phrase “better than being poked in the eye with a sharp stick”. I’ve always thought that that was a fairly common phrase, it was certainly used often by my mother but on the those occasions when I’ve used it, it’s always caused surprise and mirth. Of course, all that will now change due to you. I don’t know how well you’re doing but I imagine that if Intellectual Property is anything to go by, you’re nor short of a bob but I look forward to the day when Acer is as well known as Jack Reacher is. I’m a little disturbed by being told I’m not logged into hotmail when I am, and asked for asked for my hotmail account password before I can send this message. If you get it it’s because I’ve found a away around that demand. Many thanks for getting in touch regarding my writing. Your time and trouble are sincerely appreciated, as are your downloads and kind words. I must confess that in the early days of my self-publishing journey my texts were often littered with errors of the English language variety. But I learned my lessons and these days all my books are proofread. I’ve received many, many comments on the blog but yours is the first that’s asked about a possible pun in the Acer Sansom name. It’s a good point because, as you say, I am quite partial to a little ‘fun’ with my names. Acer Sansom was originally to be called Patrick Sansom. This was after two of my favourite authors: Patrick O’Brian and CJ Sansom. However, I never really got used to Patrick and didn’t like the shortened version, Pat. And then one day I saw an article on the web about a young soldier who had died in a conflict in some far flung land. His name was Acer. I instantly liked it. Poked in the eye by a sharp stick was something my maternal grandmother used to say. She had other expressions that you would probably recognise: ‘a blind man would like to see it’ for something that was not particularly easy on the eye is one that springs to mind and always makes me smile. Self-publishing has been good enough to me to allow me to write full-time. As such, it could be said I’m living the dream. Can’t ask for more than that. And if Acer should ever grace the silver screen I can assure you of one thing: he will not be played by Tom Cruise or anyone else under 4’5″ (unless they offer me enough money to fully compromise my principles. And in case Tom reads this, I am quite cheap). Again, many thanks for your contact, which I enjoyed. Only this morning my partner and I were discussing who might play Acer. She was trying to think of a suitable blonde actor and I pointed out that if Tom Cruise can play someone who is 6’5″ and 250 lbs, blonde hair is not an insurmountable hurdle. I have to say that, despite my disgust, I watched the film ready to tear holes in it but, if one can put aside Cruise’s physical shortcomings, it’s actually a rather good film. Your maternal grandmother was probably from the same generation as my mother who was born in 1908. Since I wrote to you I have read Ten Tall Tales and re-read the first Romney and Marsh (I didn’t realise when I read it about 8 months ago that I was in the presence of greatness). I loved your comments (what my partner calls a rant when I do it) in The Crime Writer about the morons who stand up as soon as the ‘plane touches down, it echoes exactly what I’ve been saying for years. What’s even more puzzling to me is the way they’ll stare at me as if I’m crazy for not standing up. I have to agree with your comments about your earlier works being littered with errors. I’ll list them for you if you’d interested in/able to correct them. I can offer you my services as a proof-reader. I proof-read Will Patching’s Gaslighting and I do charge a reasonable fee, I charged him £0.00 and would be prepared to cut you the same deal. I can’t imagine that you’ll be any less successful than Lee Child has been and you are so much more versatile too. Just a sudden thought. It was a real “Oh my God!” moment in Loose Ends when I realised that Mrs Botha had Acer’s baby. My partner asked me what had made me gasp but of course I couldn’t tell her. Luckily I was with her when she got to it and her reaction was a long drawn out “Oooooh”. Very clever and, in retrospect, very cleverly hinted at in Dirty Business. I now have an Oliver Tidy folder on my Kindle and I can’t give you higher praise than that. I am always interested in and grateful for constructive reader feedback. This includes all typos spotted. I do note them when they are offered and every now and again I upload a revised edit to Amazon. I like my books to be the very best, in mechanical terms at least, that I can make them. So, please, anything you find and are happy to pass on, I’m happy to receive. Exactly! The looks bestowed by the standing passengers as they wait for the plane doors to open. I’m recently back from Turkey where i lived for a number of years. I travelled fairly regularly with Turkish Airlines. Turks are the worst offenders for this. At times it seemed like half the passengers were on their feet, clutching their carry on luggage, before we’d even touched down. Really pleased to learn that you’re enjoying the writing. Thanks for sharing. It’s always good to know. Downloaded The Fallen Agent. Your the only reason I kick along my Kindle. At some point I want a signed first edition novel. What I love about your books is that I was brought up very close to Romney Marsh and still visit several times a year. This means that I can picture the places in the R&M series and Booker series pedrfectly. It is that accurate reasearch and you local knowledge that brings the stories to life for me. Please keep up these series as it brings me so much pleasure. Many thanks for your time and trouble to get in touch. Much appreciated. It’s always good to hear from readers who are enjoying the stories, especially when they know the area. I’ve lived on Romney Marsh most of my life and love the uniqueness of the place. To know that that comes through in my writing makes me happy. Thank you. Certainly more Booker & Cash in the pipeline. Not so sure about the R&M Files. Just wanted to say thanks for some entertaining reads. I’ve just finished the seventh novel in the Romney & Marsh Files and loved it just as much as the previous six. The first was a freebie downloaded from Amazon a while ago – it hooked me in & I’ve bought & read the following six in less than a month. They’ve really had me gripped – I’ve had trouble putting them down, often reading into the early hours. I live in Dymchurch and have particularly enjoyed the local references within the stories; some of the comments about Romney Marsh in Unhappy Families really made me chuckle (I think that may be my favourite of the series, despite the sad demise of one of the regular characters)(deliberately not named) and I note that you’ve used the surname ‘Coker’ for two of your characters, which made me smile. Have you any plans to write more R&M Files? I have my fingers crossed! I think I’ll try Booker & Cash next and hope that I enjoy them just as much. Many thanks for taking the time and trouble to get in touch over the books. It’s always good to hear from satisfied readers. I appreciate it. It’s also nice to know that the freebee in my ‘try before you buy’ promotional thinking works sometimes. I live in Dymchurch, too, and was born and bred on the Marsh. I think that entitles me to have a bit of fun with the people sometimes. There’s more of that in Booker & Cash. I had such a lot of fun writing the R&M Files. It was of a time and place for me. I don’t have any plans to write any more, but never say never. I have too many other writing projects I want to have a go at and not enough time to realise them all. If you do give B&C a try, please let me know what you think. Being a local, you might recognise a character and a place or two. Thanks for your reply. I guess each series runs its course eventually, especially if you have lots of different projects jiggling for attention. Agree, you being a born & bred local entitles you to have a bit of fun with details, they certainly made me smile. I downloaded the first B&C last night – only a few pages read but am enjoying it already. Just finished Bad Sons. My first of your books. Thoroughly enjoyed it! Also, the ramp picture is hilarious. Thanks, Michelle. Good to know. I never stop finding the ramp picture funny, but believe me, to be there while they were constructing it and watching people trying to use it was comedy gold. Acer is a bit more serious, as I’m sure you’ve realised by now. I hope you enjoy him though. Hi Oliver, I recently discovered ‘Rope Enough’ on iBooks and have become a firm fan of Romney and Marsh! Their names stood out because of my great affection for the Marshes, I regularly holiday in Dymchurch and will be again this year, so I just had to read the book and am looking forward to reading more. I just wondered if any more of your books are likely to appear on iBooks or are they only available on Amazon? I do use both but tend to prefer iBooks when available. Hi Clive, Many thanks for taking the time and trouble to get in touch. It’s alwasy good to hears from satisfied readers. I’m afraid that only that one of the R&M Files is available on ibooks. The others are linked to an Amazon exclusivity deal. That may change this year. I love Dymchurch, especially in the summer. Beautiful beach. I do have another series (Booker & Cash) that is three books old and set in Dymchurch and the surrounding Romney Marsh. If that tempts you, please let me know what you think. Hi Oliver, I’ll certainly give Booker & Casha go. I’ve downloaded ‘Three Short Blasts’ and have already read and enjoyed the Romney & Marsh story. I’m looking forward to reading the other two. I’ll let you know how I get on with them. Many thanks for your support. Good to know you’re enjoying TSB. Hi, just started my first book, and really enjoying it, I lived on the marsh for 20 years and now live in Folkestone, so know the area well, looking forward to reading the rest. Many thanks for your time and trouble to leave such a lovely comment. Great to know you enjoyed the read. Hi Oliver, I just needed to write to you. You are so responsible for me not getting dressed in the morning, pushing my hoover round the house, eating foods that interfere with my reading, should I go on, perhaps not, I guess you get the idea I absolutely love your work. I have just completed your Acer Samson books. Wow! I spent the last 20 minutes reading Deep State in total despair, knowing I was coming to the end about to loose this amazing man. (hypothetically) left me desperate for more. Your writing moves me deeply, Iam there every step of the way, I feel the cold, the wet, the heat, the fear, the love, I feel Iam the proverbial fly on the wall throughout each of your Acer Samson books. With a sadness of heart I will be moving on to your next books which are set in my home country but not until this period of loss has past .Thank you so much for the pleasure you have given me even if I come over a little obscure. Many thanks for taking the time and trouble to get in touch, and with such positive and encouraging feedback for the Acer books! It means a great deal to hear from satisfied readers. Acer went through a lot. He deserves a break from the trials I’ve put him through but it’s possible we’ll see him again. Never say never. Many thanks again for your message. You’ve brightened my day. I have read all your books now and loved everyone of them. When will your next book be released I can’t wait. I have also taken great delight in reading your blog over the years eagerly awaiting the next instalment, the early ones in particular were very funny. Please can we have more updates. Hi Phil, Many thanks for your much valued comment. Sorry for the lateness of my reply – no excuses. It’s always good to learn that the reads are being enjoyed and that my idea of what’s funny chimes with readers’ humour. The blog was also very important to me while I was in the thick of the writing bug, so I’m glad you’ve enjoyed that too. I’m back in the UK now. Life is not the same. The opportunities for writing are few and far between at present due to other commitments (like trying to earn a living). But I will be back. One day. With new stories and new characters (and maybe some more of the old ones). I finished “Bad Sons” last night and immediately downloaded the next book “He Made Me Do It”! I loved Bad Sons and found it compelling reading. Booker is a wonderful character engrossing, likeable and all too human. I am looking forward to the development of Jo Marsh in book 2. Your writing is deceptively brilliant. It starts out as simple, direct prose, descriptive with a touch of humor and then, before the reader realizes it, he/she has been enveloped into a complicated, tangled and well told mystery! Please continue to provide your readers,and, especially me, with such reading joy! Thank you! Many thanks for your time and trouble to leave such a positive and encouraging comment. I’m so pleased that you enjoyed Bad Sons. I had a lot of fun writing the B&C books. At times they are very close to home (Bookers is a building I live in, in Dymchurch, although it’s not a book-themed coffee shop… yet, and there is a lot of me in David Booker – the plonker bits). I hope He Made Me lives doesn’t disappoint.